I've actually continued knitting. Many times I've started projects in a whirl of dedication, only to drop them when the demands of working full time press in. This past week was very busy at work and I ended up having to work six hours on Saturday, something I NEVER do, and won't be doing again for a long time, if I can help it. Weekends are sacred. I still managed to sit in the backyard today, take some cute bird pictures and continue knitting so that the back on my sweather is now 7" long. It has to be 16 1/2" before I change the knitting pattern and begin to get ready for the upper back and sleeves. 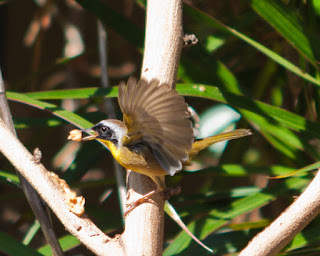 We have a couple of Common Yellowthroats in our back yard this year. A male and female. 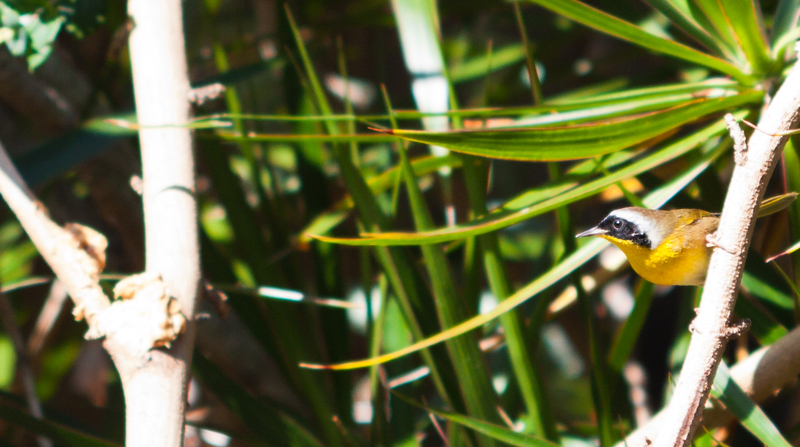 These are warblers found all year round in Florida, especially in the Everglades. Not so much in back yards, but I'm so pleased to host these two. They are usually bug eaters and shun feeders. They are not interested in seeds, like the Painted Buntings, the Grackles, Bluejays, Redwings, Sparrows, Doves, Parrots, etc. etc. (in other words, everybody else but warblers). They strictly like their protein. Since I don't use insecticides, and I'm getting ready, once birding season is over (and they go back home) to fight an infestation of white fly here, there is plenty for them to eat. The mockingbirds are different. They like seeds, bugs, peanut butter, and, I'm proud to say, leftover cooked yams. I witnessed a fight over the yams. Mr. or Mrs. Mockingbird were NOT going to let anyone else have any of the orangey, yammy goodness. We saw the mockingbird in the yard today, and they usually begin to like protein towards the end of winter, when they begin mating and building nests. 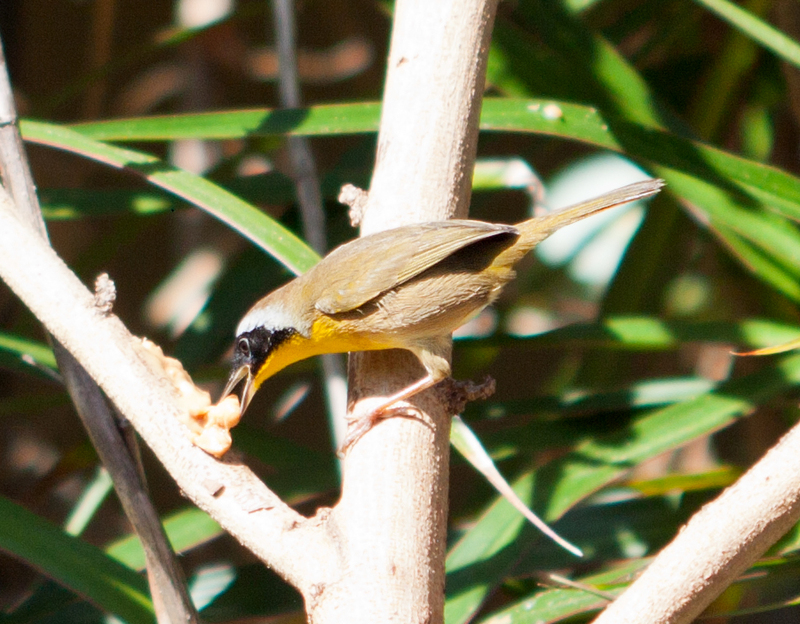 For this reason, I put out a big spoonful of crunchy peanut butter on some branches for Mr./Mrs. Mockingbird. The male has an adorable black mask as you can see in the pictures. They are beautiful little birds. 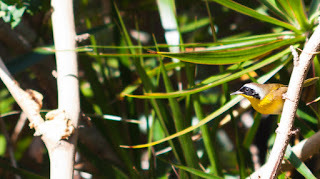 The female has a bright yellow belly, but no mask. 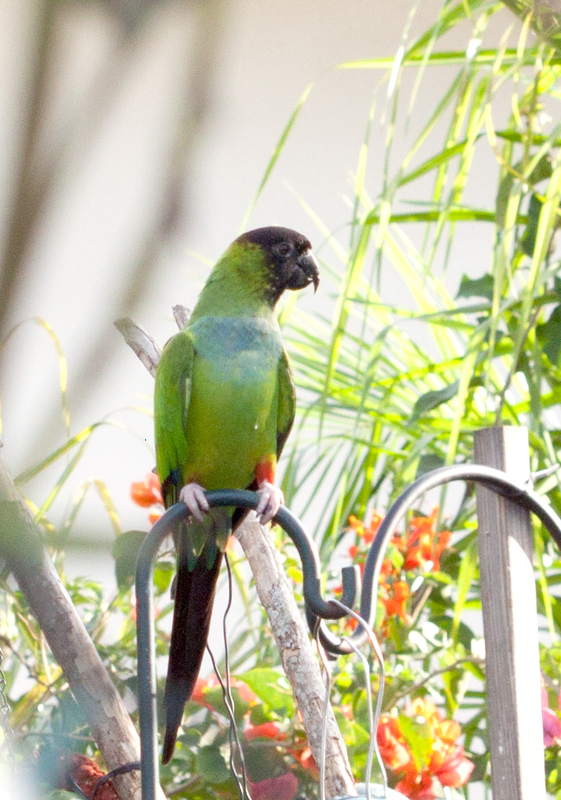 Earlier in the day we had a visit from some parrots that rarely come to our yard. We get the VERY common Monk Parakeets, which are not only in Florida, but, due to the way they build a communal nest, they live all over the country, even in cold places. Since they all sleep together in a bunch inside their big nest at night, they stay warm. 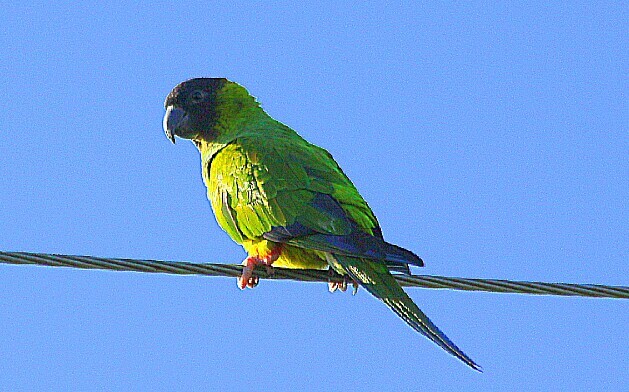 There are other parrot species in Florida, however, that have established themselves. It always starts with an escapee that survives, finds a mate and - voila - you have the beginning of a new species settlement of parrot. There are wild Macaws here, Blue Fronted Parakeets, Red Cheeked Parakeets, and many more. One of the escapee species here is the Nanday Conure or Black Headed Parakeet. A small group of them came to the seed feeder in our yard this morning. We can tell the difference when they are flying in, because their screech is lower and more gutteral than the Monk Parakeet's. They also sound a lot like the Blue Fronted Parrots and we came out once thinking we would see the Nandays, and there were some Blue Fronteds on the wire over our backyard. Here is a not too good picture of the Nanday Conures at our feeder this morning. The second picture was taken by my husband. They are pretty big parrots - not as big as Macaws, but bigger than Monks. I love to see and hear them. They have red legs and all parrot's colors are just beautiful. We've had cardinals on the snow recently but I also saw a tiny bird outside my dining room window. I didn't get there soon enough to tell what kind it was but I don't remember ever seeing such a bird in winter. I guess it may be the weird up and down temps we've had this year. It is confusing the little guys.